Troy Landry and his family were one of many traditional hunters in the bayous of south Louisiana. Now they bring their culture to reality TV on History Channel’s Swamp People. Troy Landry, with his thick accent, dad fashion, and dad jokes, became the show’s star after it premiered in 2010. Ten seasons in and Troy is still the favorite Landry of the lot, and we’ve got Troy Landry’s wiki because, let’s face it, you want all the scoop on the King of the Swamp. Troy Landry was born on June 9, 1960 in Louisiana, to Duffy and Myrtle Landry. We’ve seen Duffy on the show, where he shares Troy’s dad humor. Troy also revealed on the show that he is one of 14 children, including two siblings who were adopted. He’s also the oldest of four brothers in their big brood. Swamp People follows the lives of alligator hunters living in the swamps of the Atchafalaya River Basin in Louisiana. The Landrys and most of the families in this region are descendants of French-Canadian refugees from centuries ago. Five generations of the Landry family, (Troy is a third-generationer) have called Pierre Part, dubbed as one of the “most French” towns in the U.S., their home. Troy’s father owned a bait shop selling bait to crawfishermen and crabbers in the bayou. Duffy now operates a gas station in the town. Troy’s distinct accent is identified as the Cajun English dialect, heavily influenced by Cajun French and widespread in southern Louisiana. While the younger Landry boys’ accents aren’t as thick, Troy does have an accent similar to Duffy’s. The show allows the cast to bring the Cajun food, culture, and way of life to mainstream attention. “I hope they just see us for who we are: good-hearted, hard-working people. We never meet a stranger. We try to make everybody welcome,” Troy said. Swamp People is filmed during Louisiana’s 30-day alligator harvesting season in late August through September. It’s said to be a community tradition that dates back 300 years and is now regulated by strictly enforced wildlife laws. Troy has been hunting since he was a little boy and has done over 20 seasons by himself. Troy; his sons, Jacob, Brandon, and Chase; and nephew, Holden—along with fellow hunters on the show—have a limited number of tags to be attached to their kills every season. They have to brave dangerous conditions to use up every last tag, as their annual income depends on a single season. Three months before the season begins, they are occupied with preparations, scouting, and paperwork. The rest of the year, these hunters are prolific crawfishermen. Troy doesn’t fish crayfish anymore and instead sticks to brokering. But in his heyday, he held the record for fishing 4,500 pounds of crustacean in a single day. The regulated culling season allows hunters to keep the gator population in check before these prehistoric killers wade into human territory. Troy has even said that some of the alligators they’ve caught are older than all of their ages combined and the older the gator, the more difficult they are to catch. When the network approached them for the show, the local business was in a slump. “Well, the year [History approached them] the price of alligators had dropped to nothing, and I don’t think I’d [have] paid my expenses that year if it wasn’t for the History Channel … alligators that went for $48.00 a foot the year before went for $12.00 a foot that year. So if it wasn’t for them paying my expenses, I don’t think I’d have made a dollar that whole month,” Troy recalled. Having a filming crew join them on the hunt makes it difficult for the experienced hunters, who would rather put fewer people in harm’s way. But Troy says they slow down the process for the film crew. The crew has a very small time window to get in their shot of the haul before the hunters transfer the catch to a cooler, or the Louisiana heat will rot it faster. But the show tends to focus on the family and community more than the hunting. According to Landry, the viewers see only 10% of what really happens on a hunt. 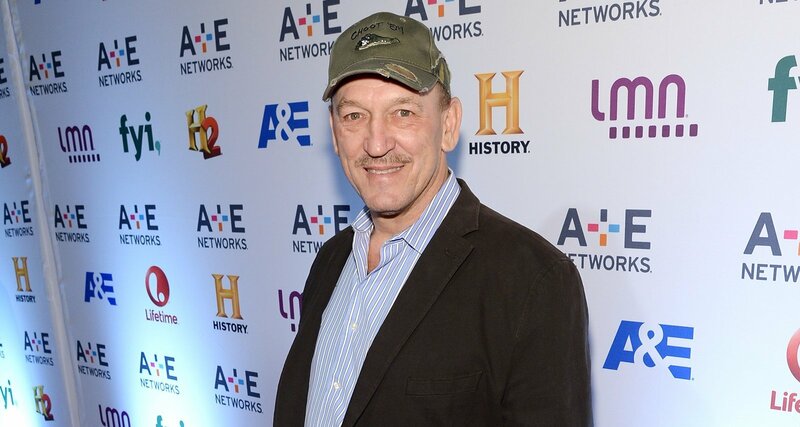 Troy’s popularity landed him a Swamp People spinoff, Swamp Mysteries with Troy Landry, which aired its first season in 2018. The show has also helped his family business and earned Troy Landry an estimated net worth of $2.0 million. There are thousands of alligator hunters in south Louisiana and Troy is grateful that the History Channel picked his family for the show. Since they appeared in season 1, not only are the Landrys and Troy’s army of beloved beagles recognized everywhere, they have also brought visibility to the local seasonal industry and culture. The area now receives an influx of tourists during peak season. Swamp People fans come to Pierre Part hoping to see the King of the Swamp in action. While there are several other hunters in the show’s massive cast, the Landrys stand out—and particularly, Troy. It’s not just his signature one-liners, including his trademark “Choot ‘em” in his thick accent, it’s also the striped polo shirt we have seen on the show one too many times. “It is my lucky shirt, and I had about seven or eight of ’em and I’m down to about three now. I’m trying to find me some new ones, and the wife can’t find none that’s exactly the same,” he said, adding that he finds some big catches when he wears his lucky shirt. But there’s also a practical reason behind it. Troy and most of the cast often wear similar clothes for editing continuity during filming. Troy’s striped style is simply more memorable than the plain clothes others wear. The hunters also can’t go anywhere without their boots. Troy once recalled his rubber boots saved him from loosing a foot to a gator. Troy has reportedly been married to Bernita Landry, a teacher at a local school and now History Channel publicist, since September 26, 1981. They are parents to Chase, Jacob, and Brandon, who are also seen on the show. Troy and Bernita also have a few grandkids. The Landry home has been a big part of Swamp People from the beginning. But Bernita and Troy initially had a different dream home in mind and were saving up for it for decades. A couple of seasons into Swamp People, Troy was finally able to build their dream home, which became a regular feature in New Orleans publications in 2012. Bernita had previously asked Troy to buy his grandparents’ old home. Instead of putting all the work into fixing an old home, Troy decided to build a home himself using the cypress wood he’d collected log by log out of the nearby swamps over three decades. The spacious home has two kitchens so Troy and Bernita don’t infringe on each other’s culinary territories. There’s also a 12-foot cypress dining table Troy built. The porch has a stunning view of the bayou, including some gators who come out on their yard to sunbathe. They let them be as long as they aren’t harming anybody. The Landrys also have a camp at Lake Verret, which is the center of the Landry family gatherings on the show.